I started powerlifting in January 2015. Growing up, I battled with depression and social anxiety due to mental and physical abuse which eventually turned to addiction to cope. Over the years, after hitting rock bottom a few times, I learned to dig deep – I believe that was my first experience with finding strength and I wanted more of that. When powerlifting found me, I was immediately drawn to that aspect of the sport. You have to dig deep, persevere, overcome fear, and be confident. You get strong from the inside out in this sport. Raw, but I am looking forward to putting on some wraps and competing Classic Raw this summer! 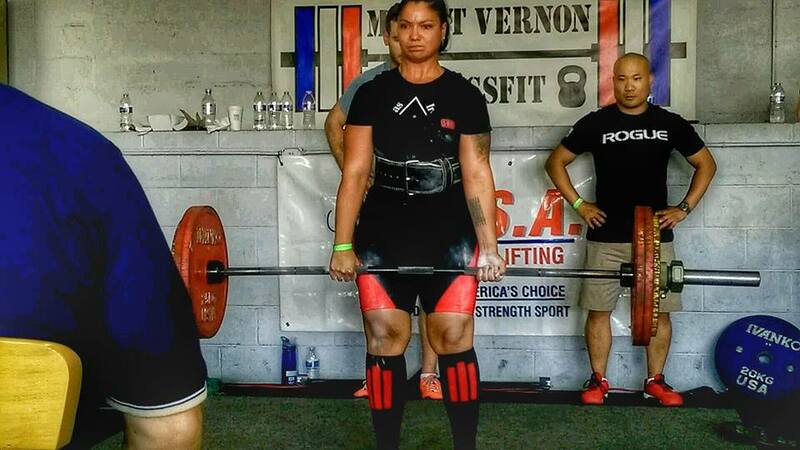 I qualified for 2015 USAPL Raw Nationals at my very first meet. Totaled 1080 at USPA Battle of the Bay 3 in Tampa, FL. I love that there is no limit, physically or mentally, in this sport. You can always challenge yourself in every way and set new goals. Steve Goggins for all that he has done for this sport and giving back to the powerlifting community. I am also inspired by all the Hall of Fame lifters, and every lifter who puts in the work, never misses a training session, and shows up to leave it all on the platform! Faith and perseverance. My dad, because he is the strongest man that I know. My close family members and friends who supported me along the way in this journey of mine. Mindset, proper nutrition, and recovery. I am motivated by my dreams of being a world champion. Every time that “life happens”, I remind myself of what it is that I came here to do. Powerlifting is the type of sport that you get what you put in. My mind. It is so easy for my mind to play tricks on me. Whether it’s not believing I am strong enough to make a lift, good enough to compete, or ignoring pain/training through injuries. That type of thinking can be one’s biggest setback. I have had to learn to overcome any negative thoughts and change my perspective in order to become a better person and a better athlete. In many ways, this level of focus and determination has helped me in my daily life outside the gym. Yes. It has taught me the true meaning of perseverance. It has helped me make a connection…all the times I wanted to quit but didn’t, when I went through very difficult moments in life, I can apply the same principles when it comes to my training and everything leading up to a competition. Don’t be in such a rush to learn everything and anything about powerlifting all at once. There are MANY schools of thought, many styles of coaching, many federations. First, decide that you will be a student of the sport, dedicate yourself to learning the basics and focus on technique. Do not compare yourself to others. Stay humble. Finding a coach that will nurture and instill those principles in you will pay off so much in the long run. I studied martial arts for a few years when I took up Muay Thai boxing. I have also been a Bikram Yoga practitioner for several years. I am a web developer… If you like this website, holla at me! I enjoy cooking, watching movies/catching up on shows, spending time with my friends, family and my dog, and I also enjoy visits to my chiropractor. After overcoming some extreme injuries, I trained for a meet and I bombed. Feeling devastated over it, I was ready to quit this sport altogether. My friend and teammate CC Holcomb reached out to me soon after. She saw the potential in me and knew if I was put in the right hands, I would excel and be successful. CC and DJ Holcomb both reached out to Steve and put us in contact. The rest is history! The first day I ever trained with Steve and the team was amazing. I have never felt SO welcomed. It was inspiring to be around everyone because each member of the team is hard-working, strong, and determined. You can’t help but to feed off that energy. When you put us all together, we are unstoppable! TECHNIQUE! Steve doesn’t miss a beat. The smallest adjustments make a world of a difference in my lifts. All of my lifts are improving drastically. In the past, I would overtrain 5x a week, constantly maxing out, and always injured. Steve has a “less is more” approach, we don’t max out just to max out. I am the strongest and most technically-sound that I’ve ever been, and we are just getting started!